1. Preheat a griddle pan over a high heat (or get your barbecue ready). For the dressing, finely grate the lemon zest and combine with the crème fraîche and oil, garlic and sugar. Cut the lemon in half and place on the griddle (or barbecue), cut-side down, for 1-2 minutes until lightly charred. Leave to cool. Add lemon juice, to taste, to the crème fraîche mixture then season and set aside. 2. 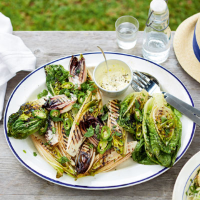 Brush the chicory halves with a little oil and add to the pan (or barbecue), cut-side down. Cook for 2-3 minutes until lightly charred then transfer to a serving platter. Repeat with the Little Gem hearts but cook for just 1-2 minutes on each side. Drizzle the dressing over the salad and finish with the mint and chopped chilli. This recipe was first published in Mon Apr 28 15:29:00 BST 2014.